Shhhhh, it’s a secret. The sun has finally arrived in Seattle, but don’t say that too loudly or you might scare it away. With the sun comes better moods and people out and about everywhere. I’ve seen my neighbors more in the past week than I have in the last 3 months! It’s hard to believe that the weather can have such an influence on a person, but with the sun comes a feeling of lightness and ease that I find surprising every year. Something inside of me loosens that I didn’t even know was tight until it relaxes. Maybe it’s the fact that I’ll be making less dishes (and therefore less work) as the cooking moves out to the grill! I can always bring it back to the kitchen somehow. The recipes I’m writing here are an easy weeknight meal that can also be worthy of company, they’re that good. And even better, quick. The marinade is my own design and the thing I love about it (besides the flavor and its adaptability), is it only needs to sit for 15 minutes. I rarely have it together during the week to organize an overnight marinade even though I love the big flavor results. This recipe gives big flavor in a short time. 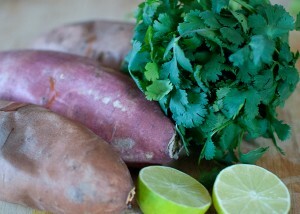 The sweet potatoes are from Alice Waters and are a perfect pairing. Put them in the oven when you first get home and the rest is a snap. 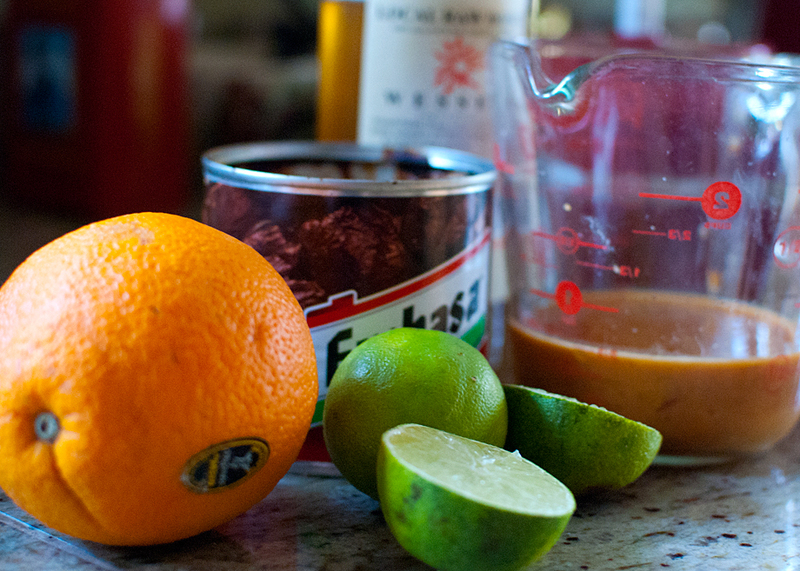 Make marinade by juicing the lime and the orange. You should have a little less than 1/4 cup lime juice and about 1/4 cup orange juice. (A small aside: I always juice the other half of the orange and put the juice in an equalish amount of white wine. Yum! A refreshing treat to keep the cook happy.) Put the juice, olive oil, chipotles and salt in small food processor or blender. 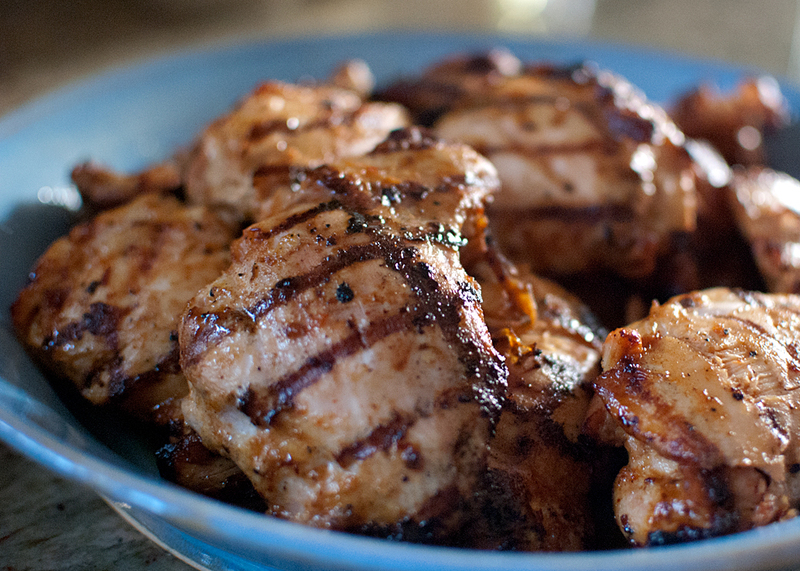 You should end up with a little over 1/2 cup marinade. Put thighs in a bowl or plastic bag and pour 1/3 cup marinade over chicken. Stir to coat chicken and let sit at room temperature for at least 15 minutes. Take the unused marinade and stir in the 2 tsp of honey. Set aside. Heat grill and cook thighs until done. 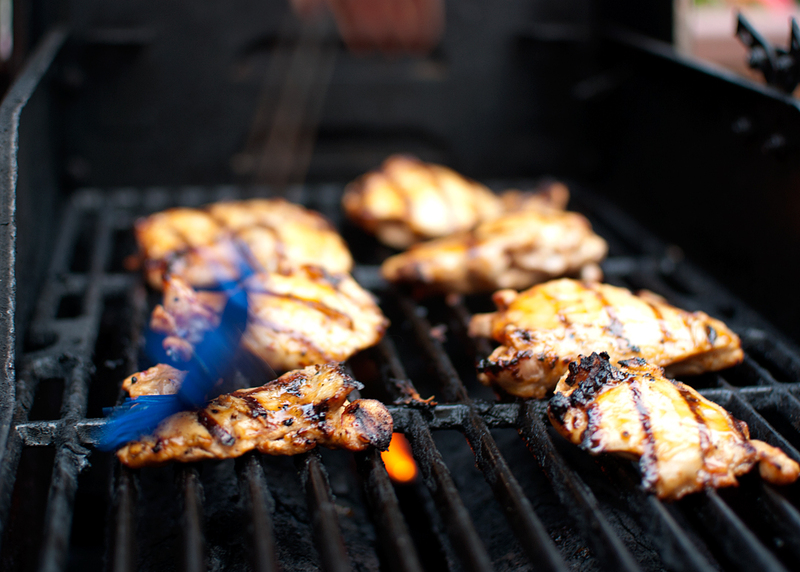 Before removing from grill, brush marinade on one side of thighs and close grill for 1-2 minutes. 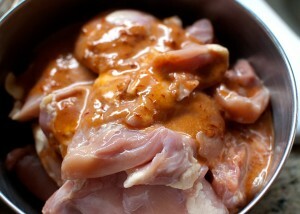 Turn over the thighs, brush the other side with marinade then close grill for another minute or so. 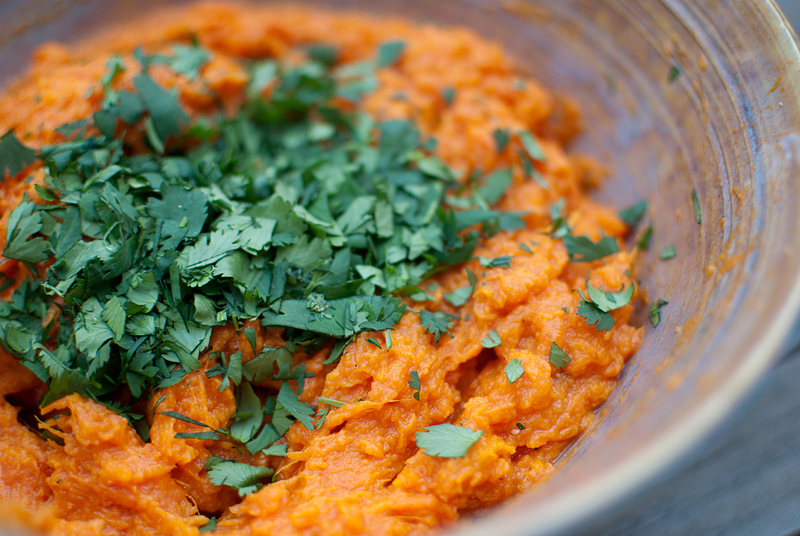 Turn again, cook briefly and serve with mashed sweet potatoes-recipe following. The lovely surprise of this recipe is the way the tartness of the lime juice balances out the sweetness of the potatoes. And the cilantro is not only gorgeous, it adds its own little special something to make this a far step from your Thanksgiving sweet potatoes. Preheat oven to 375 degrees. Put whole sweet potatoes in oven and roast until tender when pierced, 45 minutes to an hour. Remove skin, put in bowl and mash. Add butter, salt and pepper and combine. Squeeze lime juice over, stir and sprinkle with cilantro. Serve, adding more cilantro if desired.